LATE MR. JOHN COLE. The funeral of the late Mr. John Cole, whose death occurred on Saturday morning, at the age of 70 years, took place yesterday at West Devonport, and the cortege was one of the most lengthy in the history of the town. The coffin was covered with the Union Jack and the Orange banner, and there were many beautiful flowers, including wreaths from the Devonport council, the Loyal Devon Orange Lodge, St. George's Society, and the Presbyterian Sunday school. The service at the grave was conducted by Rev. D. S. Jones, and amongst those in the cortege were Lieutenants Loane and Dransfield, representing the military. The late Mr. Cole had an adventurous career. He was born at Portsmouth, England, in 1844, and was the son of the late Thomas Cole, a member of the 12th East Suffolk Regiment. When he was six months old his father's regiment was ordered to come out to the colonies, and for some time it was stationed in Melbourne. Ten years later Mr. Cole, sen, was transferred to Hobart, and was subsequently retired on a pension after a long period of service. At an early age Mr. John Cole evinced an interest in the army, and when just over 12 years of age he joined his father's regiment, then in Hobart, as a drummer boy. 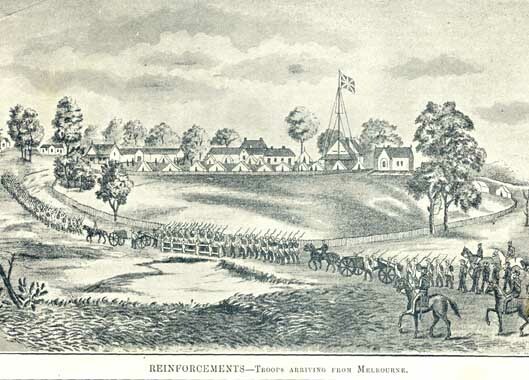 The regiment was sent to Sydney, and went into barracks, after which they were sent out to the Eureka Stockade, where the miners had revolted on the question of miner's rights. Mr. Cole returned to Tasmania in the early sixties, and upon the outbreak of war in New Zealand the 12th East Suffolk were despatched to the scene, Mr. Cole being 19 years of age at the time. He was engaged in the war with the Maoris for some four or five years, during which time he distinguished himself. On November 20, 1863, Mr. Cole performed a gallant action, for which he received the New Zealand cross "for conspicuous bravery." Some of the regiment were crossing a river on a pontoon under a terrible fire, when two of the number slipped off into the water. With great presence of mind and courage, Mr. Cole hastily snatched up a rope and plunged in to the rescue. He ran the rope round the two men and under their arms, and effected a rescue. On another occasion, a party was on the other side of the river to the regiment, when they were pressed by natives. All with the exception of two were able to swim across the river, and Mr. Cole again came to the rescue. Securing a canoe, he strapped the two men to it, and swam with them across the stream. Mr. Cole received the service medal with no less than ten clasps attached to it, he having taken part in the following battles: Pontoko, Piko Piko, Rangiriri, Rangia-waina, Orkan, Gate Pah, Te Ranga, Pukerimo, Nukermara, and Nguto-o-Te-Mann. After the Maoris had been defeated, the regiment was ordered back to England, and acceding to his mother's request, he bought his discharge, and returned to Hobart. He then went to Port Arthur as a constable, and had the distinction, while on sentry duty there, of being the first in the state to sight the ship conveying the Duke of Edinburgh to Tasmania. After nine months' service in the penal settlement, Mr Cole came north, and was married at Ross. In 1868 he joined the territorial police at Launceston, and St. Leonards, just outside the city, was his first station. He was then transferred to West Tamar. Having performed some smart detective work on several occasions, his abilities were recognised, and in 1877 he was promoted to the rank of sub-inspector, and was transferred to Stanley. He was next moved to Ulverstone, where he encountered three ruffians on the bridge one night, and received such severe injuries to his head that for a time his condition was extremely critical. Right up to his death Mr. Cole felt the effects of this attack, which was made with the object of securing possession of the keys of the police buildings. Mr. Cole's next stations were Lefroy, Port Cygnet, Newtown, Devonport, and Selby (near Launceston), where he retired in 1897, after a period of 29 years' faithful service. He then paid a visit to New Zealand, but some sixteen years ago he returned to Devonport, and was appoint ed inspector to the Devonport Town Board, a position that he held until his death. ↑ Launceston Examiner, 30 March 1915. This page was last edited on 25 November 2018, at 09:48.